Standing: Brian Samuel, PPP Regional Head, Caribbean Development Bank, facilitated the training session on the Caribbean PPP Toolkit, May 5, 2018, at the offices of the Development Bank of Jamaica. 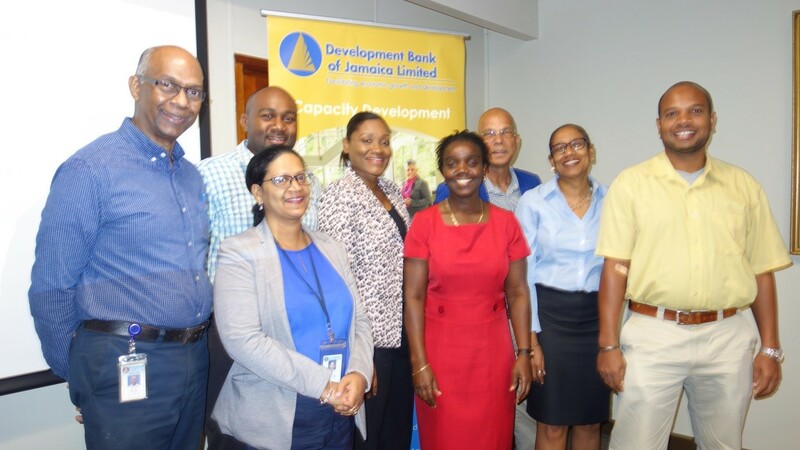 Left to right: Ivan Anderson, NROCC; Nicola Russell, Manager, P4 Unit; Ricardo Munroe, Manager, P4 Unit; Alicia Bish, MOFPS; Monica O’Meally, MOFPS; Brian Samuel, Caribbean Development Bank; Denise Arana, P4 Unit; and Steven Shaw, NROCC. Renay Johnson, P4 Project Manager, left, converses with Denise Arana, P4 General Manager, at the Procurement Consultation Workshop. Copyright © 2019 Development Bank of Jamaica.